Characterized as a "high stepping filly" by a veterinarian friend of her family when a budding adolescent, meine Überfrau likes to think of herself as "high maintenance," a species seldom found in Flagstaff. 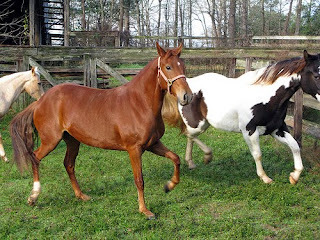 When her "high maintenance" "high stepping filly" mind turns to gardening and fresh vegetables, she invariably focuses upon the "Queen of Sheba" type of vegetables found under glass in special bins with tongs attached at the supermarket, sometimes even in hermetically sealed containers. This Vogue of Vegetables includes what the French call mange-tout, meaning "eat all." Two mange-tout are snow peas (Pisium sativium var. saccharatum) and the sugar snap peas (var. maccrocarpum) because both the pea and the pod are eaten. The snow pea has been cultivated for about 12,000 years, originating along the Burma and Thailand border. They are peas picked before maturity so that they are flat with only hints of the peas inside and are savored for the pod, not the peas. Gretchen's mother called them "Chinese pea pods." 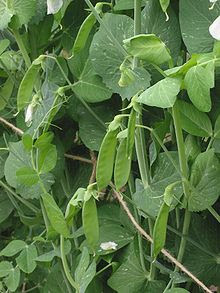 The sugar snap pea, on the other hand, is only about forty years old, first developed by Dr. Calvin Lamborn for the Gallatin Valley Seed Co., in Idaho Falls, Idaho, in 1979. In the late nineteen sixties, he discovered a mutant in his breeding stock and began breeding it with the snow pea, producing the sugar snap pea a decade later. 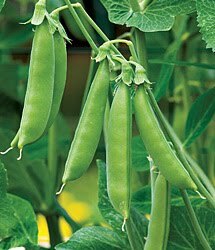 While the snow pea is fancied for the pod, the peas themselves not being particularly flavorful, the sugar snap pea is favored for both peas and pod, as well as its juiciness. As with nearly all "high stepping" types, sugar snap peas are a hardy, cool season customer. While they may appear delicate and frail, they can even take a light frost and can be sowed a couple of weeks before the last frost of the season. Sugar snaps demand a soft bed of friable soil with an abundance of comfortable organic matter. Since they produce their own nitrogen, in horticultural circles called a "fix," they favor a fertilizer low in nitrogen. The nitrogen fix is the sugar snaps' uncanny ability to convert nitrogen in the atmosphere into nitrogen usable by the plant by means of little nodules on its roots. Originally a vine about 6-8 feet tall, sugar snaps now come as bushes, such as Sugar Daddy and Sugar Ann, and well as vine. Now, the climbers, as do all climbers, social and horticultural, demand special attention, as in special arrangements, like lattices, fences, etc. It is reputed that the climbers are more productive and taste better than the bush. I don't know since my taste buds are corrupted by overuse and age, even aged extra sharp Vermont cheddar nowadays seems mild; however, Gretchen, who fancies that hers are still in working order, claims the climbers are tastier. As with a lot of climbers, sugar snap climbers need support. I've found a well-proportioned method of raising sugar snaps in a container which is readily accessible to the kitchen door. A container, approximately a foot and a half to two feet in diameter, with a large tomato cage stuck in it for the climbing does quite well. The seeds should be sown an inch deep and 2-3 inches apart, but since they have a higher sugar content than other peas, the seeds shouldn't be allowed to languish in the ground too long for fear of rotting. They can be sprouted for early planting or germinated in germinating kits found at commercial nurseries. They can also be sown later. They should be harvested when the pods are filled out and the peas inside are full size. Overcooking and canning turns the sugar to starch, destroying the sweet flavor. They should be cooked no longer than three minutes, boiled or stir-fry, or can be blanched for no more than a minute to cut the agricultural taste for the finicky. Of course, they are best eaten raw either individually or in salads. Home-grown are best because the supermarket sugar snaps are too long off the vine and long in the tooth, turning the sugar into starch. However, home-grown seldom reach the kitchen because they'll be eaten right off the vine dust and all.